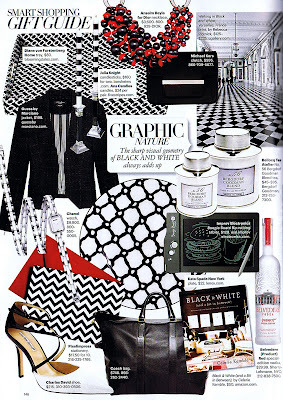 I spotted these chic note cards in a gift round-up in the December 2011 issue of Harper’s Bazaar. It seems like most of the time the items featured there are way beyond my budget so it was exciting to see these 10 cards and envelopes by Pixelimpress were just $17.50 and I couldn’t resist buying a set. From the December 2011 issue of Harper’s Bazaar. I adore the black and white chevrons and the envelope is the perfect shade of red. They feel so Art Deco and elegant and I love that they are put out by a small stationery company owned by a woman in Prosper, Texas! Pamela Sherry, the owner and designer of Pixelimpress, has a blog so I am looking forward to reading about her design inspirations, as well as seeing what other stationery products she makes and sells. In the meantime, I have some notes to write and I hope what I say is half as glamorous as these cards. I bulk buy cards so that I always have some on hand for writing notes. I like the graphic page from Harpers and those note cards certainly look striking! Very chic! There is still nothing like getting a hand written note from someone, espcially when it comes on beautiful stationary. You are always glamourous, dear Jill. Loving the card and envelope. I thought it was a clutch at first. I love cards like this...how fun and inspirational...I could see a great outfit inspired by these cards!! Those are very striking! I have recently taken to buying fancy notecards. It makes writing and sending them so much more fun! When I saw the first picture I honestly thought it was a clutch at first. Wouldn't that make the most gorgeous clutch? Ahh, darn. But, they're absolutely gorgeous as notecards too! I love the look, very sharp and stylish. The cards are beautiful! I had to laugh at your post title, thinking that you were participating in Every body, Every Wear today. The note cards are fabulous, I love red, white & black together! My right knee is fine, but now the left one hurts a little. I am having a chek up on the 24, but very lucky, really. Do you know that I dog-eared that same page for the SAME CARDS! they look as fab IRL as they do in the mag. I miss stationary and writing notes. Actually, because I sent so few Christmas cards this year, I told my hubby I HAD to send top-quality cards. He thought I was crazy, but I loved every minute of feeling those cards in my hands. And don't even get me started on letterpress. Gah.I could spend thousands on paper!